As kick-off approached on a grey wintry afternoon, a banner was passed between Cardiff City and Leicester City’s fans – two tribes setting rivalries aside, uniting to pay their respects. The flag bore the clubs’ emblems and the national flag of Thailand in tribute to Leicester’s owner Vichai Srivaddhanaprabha, one of five people killed in a helicopter crash near the club’s King Power Stadium last weekend. 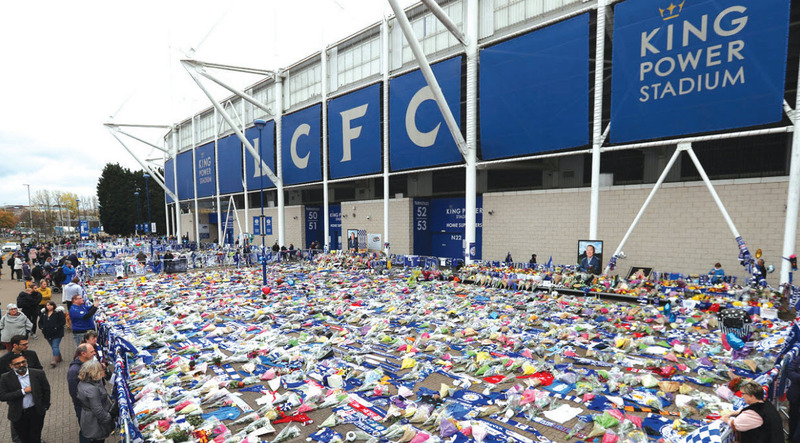 This was Leicester’s first match since the tragedy and the game itself felt incidental. After a wreath was laid on the pitch, the two sides gathered around the centre circle for a minute’s silence and the usually boisterous Cardiff City Stadium fell profoundly silent. The crowd was consumed by the stillness. Players were in tears as the hush fell. And then came the noise. On the pitch, this looked like any other match. In the stands, it was one like no other. And after a week of tributes, Leicester provided another with a courageous victory, clinched by Demarai Gray’s goal, which prompted emotional celebrations that will be etched in the club’s history. Within an hour of the game finishing, the players were on the way to the airport to attend billionaire Srivaddhanaprabha’s elaborate funeral, which had begun earlier in the day in Thailand. The royally-sponsored funeral was being held at a Bangkok temple, and attendees included top government officials, business people and other public figures before the Leicester players arrived. The grounds of the temple, Wat Thepsirin, were guarded by scores of security officers. White sheets were lowered to block outsiders and the news media from viewing the proceedings. The chanting of monks, amplified by loud speakers, could be heard resonating around the temple’s grounds. The crash left fans in mourning, with many making a pilgrimage to the club’s stadium to leave flowers and other mementos for the owner. Tributes were also left for the four other people who died in the helicopter crash: two members of Vichai’s staff, Nursara Suknamai and Kaveporn Punpare; the pilot, Eric Swaffer; and another passenger, Izabela Roza Lechowicz. The Air Accidents Investigation Branch said it had been able to obtain information from the device even though it was subjected to intense heat in the fire. Inspectors have started to analyse the data to determine what caused the aircraft to spiral out of control shortly after take-off. A video has emerged online showing the helicopter take off from the stadium’s pitch, ascending upwards before starting to rotate wildly in an uncontrollable spin. Experts believe that a tail rotor malfunction is the most likely cause of the accident. The wreckage was removed from the crash site late Thursday. Leicester players have expressed their sense of deep loss, with striker Jamie Vardy writing on Instagram of Srivaddhanaprabha: ‘To me you are legend, an incredible man who had the biggest heart, the soul of Leicester City Football Club. Thank you for everything you did for me, my family and our club. I will truly miss you … may you rest in peace …#theboss’. England defender Harry Maguire wrote on Twitter how Srivaddhanaprabha had supported him at the club and at international levels during the World Cup, describing the Thai billionaire as ‘a truly great, kind, loving man who will be missed so much by everyone’. At times like these, football is truly put into perspective. It also shows the beautiful side of the game; how two sets of tribalistic fans can come together in harmony and pay respects without resorting to chanting vitriol at each other. The GulfWeekly team would like to express our deepest respects to Vichai Srivaddhanaprabha and the four others who tragically passed away.